CURREN, RANDALL and BLOKHUIS, J. C. 2018. Friday Night Lights Out: The End of Football in Schools. Harvard Educational Review, Vol. 88, Issue. 2, p. 141. Curren, Randall and Metzger, Ellen 2018. The art of preserving opportunity: A response to Ferkany, Ahlberg, Macleod and Ruitenberg. Theory and Research in Education, Vol. 16, Issue. 1, p. 113. Curren, Randall 2018. Ethics Across the Curriculum—Pedagogical Perspectives. p. 273. Curren, Randall 2017. Why character education?. Impact, Vol. 2017, Issue. 24, p. 1. Dum, Jenn and Guay, Robert 2017. Hegel and Honneth’s Theoretical Deficit: Education, Social Freedom and the Institutions of Modern Life. Hegel Bulletin, Vol. 38, Issue. 02, p. 293. Curren, Randall 2016. Aristotelian versus virtue ethical character education. Journal of Moral Education, Vol. 45, Issue. 4, p. 516. Curren, Randall 2014. Motivational aspects of moral learning and progress. Journal of Moral Education, Vol. 43, Issue. 4, p. 484. Kristjánsson, Kristján 2014. Phronesis and moral education: Treading beyond the truisms. School Field, Vol. 12, Issue. 2, p. 151. Curren, Randall 2013. A neo-Aristotelian account of education, justice, and the human good. School Field, Vol. 11, Issue. 3, p. 231. I am grateful to Kate Elgin, Emily Robertson, Brett Sherman, Harvey Siegel, an anonymous referee for the journal, and the journal’s editors, David Schmidtz and Carmen Pavel, for their helpful written comments on earlier drafts of this essay. I would also like to acknowledge valuable discussion of this work with the other contributors to this volume. 1 Plato, Apology 30b, in G. M. A. Grube, ed. [trans. ], Plato: The Trial and Death of Socrates (Indianapolis: Hackett Publishing, 1975), 33. 2 See, Marrou, Henri, A History of Education in Antiquity (New York: Sheed and Ward, 1956); Curren, Randall, “Education, History of Philosophy of,” in Craig, E. J., ed., Routledge Encyclopedia of Philosophy, vol. 3 (London: Routledge, 1998), 222–31. 3 For leading accounts of rationality or critical thinking as a fundamental aim of education, see Siegel, Harvey, Educating Reason (New York: Routledge, 1988); Lipman, Matthew, Thinking in Education, 2nd ed. (Cambridge: Cambridge University Press, 2003). 4 I have defended the first of these premises most recently in Randall Curren, “A Neo-Aristotelian Account of Education, Justice, and the Human Good,” Theory and Research in Education 11, no. 3 (2013). I touch on the latter premise in the context of identifying “effective agency” as an educational aim, in Randall Curren, “Developmental Liberalism,” Educational Theory 56, no. 4 (2006): 451–68, at 466. 5 On the place of Locke’s educational philosophy in eighteenth-century thought, see Yolton, John, “Locke: Education for Virtue,” in Rorty, Amelie, ed., Philosophers on Education: Historical Perspectives (London: Routledge, 1998), 173–89; Tarcov, Nathan, Locke’s Education for Liberty (Chicago: University of Chicago Press, 1989); Lorraine, and Pangle, Thomas, The Learning of Liberty (Lawrence, KS: University Press of Kansas, 1995). 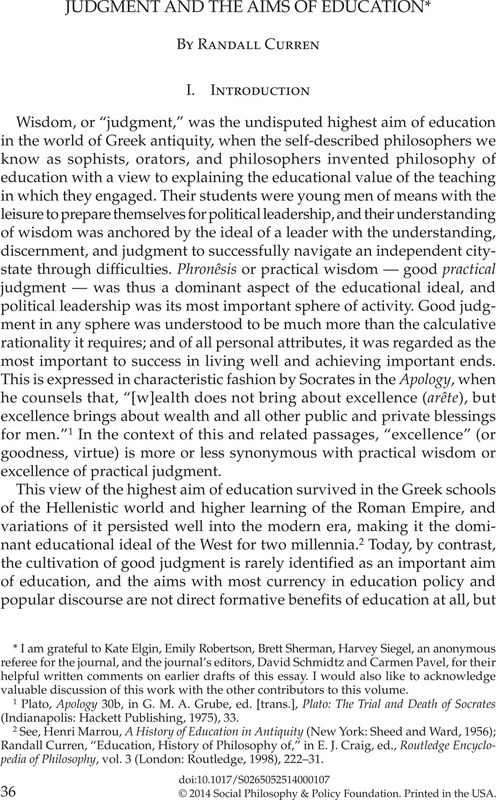 6 For a detailed account of Aristotle’s views on education, see Curren, Randall, Aristotle on the Necessity of Public Education (Lanham, MD: Rowman and Littlefield, 2000). On what is known of Aristotle’s school, see Lynch, John, Aristotle’s School (Berkeley: University of California Press, 1972). 7 Aristotle identifies the topic of his Nicomachean Ethics and Politics as political science (hê politikê epistêmê), concerned with knowing and achieving the good for human beings, at NE I.2, I.4, X.9, etc. Political science is thus explicitly both a systematic body of knowledge (epistêmê) and an art (technê), and the same is true of its component parts, ethics and legislation. The methodology of the Nicomachean Ethics is explained in I.4, and the role of universals (moral knowledge) in good judgment is noted in VI.8. For a leading translation, see Barnes, Jonathan, ed., The Complete Works of Aristotle, vol. 2 (Princeton: Princeton University Press: 1984), 1729–1867 . For further references and elaboration, see Curren, Randall, “Aristotle’s Educational Politics and the Aristotelian Renaissance in Philosophy of Education,” Oxford Review of Education 36, no. 5 (2010): 543–59. 8 This is implied by Aristotle’s discussion of politics as the master art in Nicomachean Ethics, bk. I. 1–2 and his arguments for the relevance of legislative science to household management in X.9. 10 See Marrou, A History of Education in Antiquity, esp. 160 ff. The focus of Isocratic pedagogy is speaking well, but Isocrates insists that it is by learning to speak well that students learn to deliberate and advise well, and become prudent, intelligent, and wise; “the wise (sophoi) [being] those who have the ability to reach the best opinions (doxai) most of the time” (Isocrates, Antidosis, in David Mirhady and Yun Lee Too, eds. [trans. ], Isocrates I [Austin: University of Texas Press, 2000], 254, and 251 ff. generally). The relevant sections of Antidosis are reprinted as “An Educated Person Can Speak Well and Persuade,” in Randall Curren, ed., Philosophy of Education: An Anthology (Oxford: Blackwell, 2007), 28–34. On Roman oratorical education, see Quintilian, The Institutio Oratoria of Quintilian, vols. I–IV, H. E. Butler, ed. [trans.] (London: Heinemann, 1920–22). For Augustine’s conceptualization of the liberal arts as grounding biblical interpretation, see Christian Instruction (De doctrina christiana), trans. J. J. Gavigan, in Fathers of the Church: The Writings of Saint Augustine, Vol. 4, ed. R. Deferrari, et al., (Washington, DC: The Catholic University of America Press, Inc., 1947/66), 19–235. 11 Marrou, A History of Education in Antiquity, 169. 12 Descartes, René, The Philosophical Writings of Descartes, vols. I and II, Cottingham, J., et al., eds. [trans.] (Cambridge: Cambridge University Press, 1984/5), esp. Rules for the Direction of the Mind, Discourse on Method, parts I and II, The Search for Truth by Means of Natural Light, and the Dedicatory Letter to the Principles of Philosophy. See also, Schouls, Peter, Reasoned Freedom: John Locke and Enlightenment (Ithaca: Cornell University Press, 1992), and Schmitter, Amy, Tarcov, Nathan, and Donner, Wendy, “Enlightenment Liberalism,” in Curren, Randall, ed., A Companion to the Philosophy of Education (Oxford: Blackwell, 2003), 73–93. 13 On the continuing pedagogical impact of the idea that scientific thinking is natural, see Matthews, Michael R., Science Teaching (London: Routledge, 1994), 137ff. 14 John Locke, Of the Conduct of the Understanding, sec. 41, in Some Thoughts Concerning Education and Of the Conduct of the Understanding, Ruth Grant and Nathan Tarcov, eds. (Indianapolis, IN: Hackett, 1996), 218. 15 Locke, Conduct of the Understanding, sec. 1, p. 167. 16 Ibid., secs., 3, 5, 6, 7, and 29, pp. 169, 171, 173, 175, 177–78, 180–81, 205. 17 On moral knowledge, see Conduct of the Understanding, sec. 43, p. 223; Essay Concerning Human Understanding, bk. 4, chap. 3, sec. 18 and chap. 4, sec. 7, in the unabridged edition of Alexander Campbell Fraser, ed. (New York: Dover, 1959), vol. 2, 207–9 and 232. 18 Locke refers to “the overbalance of probability” in connection with basing one’s assent on the evidence, in Conduct of the Understanding, sec. 42, p. 220. It is only in his Essay Concerning Human Understanding, however, that he describes judgment as different from knowledge in being probabilistic, and asserts that “in the greatest part of our concernments, [God] has afforded us [not knowledge but] only . . . probability,” as well as a human “liableness to error.” See Essay bk. 4, chap. 14, vol. 2, pp. 360–61. Locke wrote the Conduct as an addendum to the Essay, but the former seems decidedly more optimistic than Book IV of the Essay about the prospects for avoiding error in the conduct of our lives. The introduction to the Essay itself appears no less optimistic than the Conduct: “’Tis of great use to the sailor to know the length of his line, though he cannot with it fathom all the depths of the ocean. ‘Tis well he knows, that it is long enough to reach the bottom, at such places, as are necessary to direct his voyage . . . Our business here is not to know all things, but those which concern our conduct” (Locke, Essay, Intro. sec. 6, pp. 30–31). 19 Locke, Essay Concerning Human Understanding, bk. 2, chap. 27, sec. 26, p. 467. 20 On freedom of the understanding, see Locke, Conduct of the Understanding, sec. 12, p. 186. 21 Ibid., secs. 20, 193; italics added. 22 Ibid., sec. 24 , pp. 199–200. 23 Ibid., secs. 20 and 7, pp. 193, 182. 24 Descartes, Principles, pt. 1, secs. 33–35. Cf., Locke’s Essay, Intro. sec. 6, pp. 30–31. 25 Conduct of the Understanding, sec. 6, p. 178. 26 Ibid., secs. 7 and 6, pp. 180, 178. Cf. sec. 4, pp. 173–75. 27 Ibid., sec. 2, p. 169. 28 Schmitter, Tarcov, and Donner, “Enlightenment Liberalism,” 84. 29 Locke, Conduct of the Understanding, sec. 41, p. 218. 30 See esp., ibid., secs. 3 and 10, pp. 170, 184. 31 For an account along these lines, see Heller, Mark, “Hobartian Voluntarism: Grounding a Deontological Conception of Epistemic Justification,” Pacific Philosophical Quarterly 81 (2000): 130–41. 32 For a detailed analysis of a catastrophic system failure in which diverse experts within the same industry were unable to understand each other, grasp what was happening, and accurately assess risk, see Tainter, Joseph and Patzek, Tadeusz, Drilling Down: The Gulf Oil Debacle and Our Energy Dilemma (New York: Springer, 2012). 34 On the idea of learning as initiation pertaining to forms of goodness and not just skills or knowledge, see R. S. Peters, “Education as Initiation,” in Randall Curren, ed., Philosophy of Education: An Anthology, 55–67; Kenneth Strike, “The Ethics of Teaching,” in Randall Curren, A Companion to the Philosophy of Education, 509–24. 35 The philosophical literature on meaning in life identifies the experience of relating to objective goods in positive ways as central to lives being both objectively meaningful and being experienced as meaningful. It is uncontroversial that such relating is exemplified in activities of creation, enhancement, preservation, renewal, communication, and the like. See Susan Wolf, Meaning in Life and Why it Matters (Princeton: Princeton University Press, 2010). 36 See Ryan, Richard M., Curren, Randall, and Deci, Edward L., “What Humans Need: Flourishing in Aristotelian Philosophy and Self–determination Theory,” in Waterman, Alan S., ed., The Best Within Us: Positive Psychology Perspectives on Eudaimonia (Washington, DC: American Psychological Association, 2013), 57–75 ; Deci, Edward L. and Ryan, Richard, “Motivation, Personality, and Development Within Embedded Social Contexts: An Overview of Self-Determination Theory,” in Ryan, Richard, ed., The Oxford Handbook of Human Motivation (Oxford: Oxford University Press, 2012), 85–107. 37 It would take us too far afield to explore the split between subjective and objective accounts of well-being or living well in the massive philosophical literature that has developed in recent years. My own diagnosis of the either-or structure of this literature is that it is an artifact of relying solely on philosophical methods of investigation. The classical conception of flourishing or living well rests on the hypothesis that the objective and subjective aspects of living well are interdependent, and it is a hypothesis that is substantially empirical and only tractable through mixed research methods. 38 Locke, John, Second Treatise of Government, chap. VI, sec. 59, ed. Macpherson, C. B. (Indianapolis: Hackett, 1980), 33 . Locke’s position on this is essentially that of the common law tradition in regarding competent judgment as a condition for being answerable to law rather than a custodial authority, though he does not refer to the common law or the principles under which custodianship is jointly exercised by the state and guardians identified by the state. For a discussion of related matters of educational authority, see Curren, Randall and Blokhuis, J. C., “The Prima Facie Case Against Homeschooling,” Public Affairs Quarterly 25, no. 1 (2011): 1–19. 40 See Chirkov, Valery I., Ryan, Richard M., and Sheldon, Kennon M., eds., Human Autonomy in Cross-Cultural Context: Perspectives on the Psychology of Agency, Freedom, and Well-Being (Dordrecht: Springer, 2011). 41 Brighouse, School Choice and Social Justice (Oxford: Oxford University Press, 2000), chaps. 4 and 5. 42 Brighouse, School Choice and Social Justice, 68 ff. 43 Reich, Rob, Bridging Liberalism and Multiculturalism in American Education (Chicago: University of Chicago Press, 2002), 92, 185–87. 44 This is enshrined in such documents as the National Education Association’s 1975 Code of Ethics of the Education Profession, and the New York State Code of Ethics for Educators. The first principle of the NEA Code is that “The educator strives to help each student realize his or her potential as a worthy and effective member of society.” The first principle of the NY State Code is similarly that, “Educators nurture the intellectual, physical, emotional, social, and civic potential of each student. See http://www.nea.org/home/30442.htm; http://www.highered.nysed.gov/tcert/pdf/codeofethics.pdf. 45 Of the works cited previously, see esp. Curren, “Aristotelian Necessities”; Ryan, Curren, and Deci, “What Humans Need: Flourishing in Aristotelian Philosophy and Self-determination Theory.” These categories are intended to be exhaustive with respect to forms of human activity, but not non-overlapping. The category of productive potential is meant to range over all forms of activity directed to ends, notably those for which techniques have been established. 47 See Matthews, Michael, Science Teaching: The Role of History and Philosophy of Science (New York: Routledge, 1994) and Time for Science Education (New York: Kluwer, 2000) for the rationales and histories of different approaches to science education, and the grounds for infusing a Science, Technology, and Society approach with case studies in the history and philosophy of science. 48 National Research Council Institute of Medicine, Engaging Schools: Fostering High School Students’ Motivation to Learn (Washington, DC: National Academies Press, 2004), 17–18. 49 See Lightfoot, Sarah L., The Good High School (New York: Basic Books, 1983); Louis, K. S. and Miles, M. B., Improving the Urban High School: What Works and Why (New York: Teachers College Press, 1990); Newmann, F. and Associates, Authentic Achievement (San Francisco: Jossey-Bass, 1996). 50 The July 2009 issue of Theory and Research in Education (vol. 7, no. 2) provides a comprehensive overview of the relevant research. 51 See Strike, Kenneth, Small Schools & Strong Communities: A Third Way of School Reform (New York: Teachers College Press, 2010). 52 The PATHS curriculum (http://www.pathstraining.com/main/curriculum/) is an example of an approach to moral education (officially, a system of “social and emotional” learning) that is also a developmentally constructive approach to classroom management and alternative to the systems of punishment that have become increasingly draconian in recent years without any demonstrable effect on student compliance. For a detailed ethical, motivational, and practical critique of conventional, punitive approaches to addressing student infractions, see Matthew Williams, A Normative Ethical Analysis of School Discipline Policies (University of Rochester: unpublished Ph.D. dissertation, 2013), https://urresearch.rochester.edu/viewContributorPage.action?personNameId=4321. 53 Ben-Porath, Sigal, “Deferring Virtue: The New Management of Students and the Civic Role of Schools,” Theory and Research in Education 11, no. 2 (2013): 111–28. 54 See Pelletier, Luc and Sharp, E., “Administrative Pressures and Teachers’ Interpersonal Behaviour,” Theory and Research in Education 7, no. 2 (2009): 174–83; Ryan, Richard and Weinstein, N., “Undermining Quality Teaching and Learning: A Self-Determination Theory Perspective on High-Stakes Testing,” Theory and Research in Education 7, no. 2 (2009): 224–33; Vansteenkiste, M., Soenens, B., Verstuyf, J., and Lens, W., “‘What is the Usefulness of Your Schoolwork?’ The Differential Effects of Intrinsic and Extrinsic Goal Framing on Optimal Learning,” Theory and Research in Education 7, no. 2 (2009): 155–63. 55 Joan Goodman provides a persuasive account of authority relations and student engagement in, “Student Authority: Antidote to Alienation,” Theory and Research in Education 8, no. 3 (2010): 227–47. 56 For an account of moral education along these lines, see Fullinwider, Robert, “Moral Conventions and Moral Lessons,” in Curren, Randall, ed., Philosophy of Education: An Anthology, 498–506. 57 Matthews, Gareth, “Philosophy and Developmental Psychology: Outgrowing the Deficit Conception of Childhood,” in Siegel, Harvey, ed., The Oxford Handbook of Philosophy of Education (Oxford: Oxford University Press, 2009), 175. 58 A model for how to do this is provided by Nosich, Gerald, Learning to Think Things Through: A Guide to Critical Thinking Across the Curriculum, 2nd ed. (Upper Saddle River, NJ: Pearson Prentice Hall, 2005), a textbook designed to enable students to identify the basic structure of any field they might study, and bring the resources of those fields together in practical reasoning and judgment. 59 See Siegel, Educating Reason. 60 For an influential overview of the seminal theories and research, see Rogoff, Barbara, Apprenticeship in Thinking: Cognitive Development in Social Context (Oxford: Oxford University Press, 1990). 61 See, e.g., Richard Grandy, “Constructivisms and Objectivity,” and Matthew Lipman, “Education for Critical Thinking,” in Curren, Philosophy of Education: An Anthology, 410–16 and 427–34. 62 See, e.g., Gilovic, T., Griffin, D. and Kahneman, D., Heuristics and Biases: The Psychology of Intuitive Judgment (Cambridge: Cambridge University Press, 2002); Kahneman, D. and Teversky, A., Choices, Values and Frames (Cambridge: Cambridge University Press, 2000); Stanley Cohen, States of Denial (Cambridge: Polity Press, 2001). 63 For an engaging volume of case studies, see Heffernan, Margaret, Willful Blindness (New York: Walker and Co., 2011). Argument-focused approaches to teaching critical thinking typically do not include exercises that invite students to examine their own ideas. For an approach to critical thinking instruction that does, see Nosich, Learning to Think Things Through. 64 See Duncan, Greg J. and Murnane, Richard J., eds., Whither Opportunity: Rising Inequality, Schools, and Children’s Life Chances (New York: Russell Sage Foundation, 2011). 65 See de Vries, Bert J. M., Sustainability Science (Cambridge: Cambridge University Press, 2013); Komiyama, Hiroshi and Takeuchi, Kazuhiko, “Sustainability Science: Building a New Discipline,” Sustainability Science 1, no. 1 (2006): 1–6, http://www.springerlink.com/content/214j253h82xh7342/fulltext.html. 66 Worldwatch Institute, Vital Signs 2012 (Washington, DC: Island Press, 2012), 76–77. The emissions associated with in–flight service are only a small part of those arising from airline travel, of course, so further choices arise concerning mode and quantity of travel, whether to purchase carbon offsets, and so on. 67 IPCC (Intergovernmental Panel on Climate Change) “Climate Change 2007: Synthesis Report” (Geneva, 2007), http://www.ipcc.ch/ipccreports/ar4-syr.htm. 68 Powell, James Lawrence, The Inquisition of Climate Science (New York: Columbia University Press, 2011), 11, quoting the keynote address, “Climate Alarm,” by Richard Lindzen, an MIT professor of meteorology, speaking at a March 2009 Heartland Institute conference. The consensus seems to be that neither Lindzen’s research nor anyone else’s has identified any significant negative feedback mechanisms that would slow climate change, while several positive feedbacks are outpacing IPCC projections: the retreat of sea ice (causing a decline of surface reflectivity), accelerating decay of organic matter in soil (releasing green-house gases), decline of forests killed by drought and pests, and release of methane from warming sea beds and melting permafrost. Droughts in the Amazon in 2005 and 2010 caused releases of carbon measured in gigatons (GtC, or billions of tons of carbon), estimated at 1.2 to 3.4 GtC in 2010. See World Wildlife Fund, Living Planet Report 2012 (Gland: WWF International, 2012), 95, http://worldwildlife.org/publications/living-planet-report-2012-biodiversity-biocapacity-and-better-choices. 69 See Heffernan, Willful Blindness. * I am grateful to Kate Elgin, Emily Robertson, Brett Sherman, Harvey Siegel, an anonymous referee for the journal, and the journal’s editors, David Schmidtz and Carmen Pavel, for their helpful written comments on earlier drafts of this essay. I would also like to acknowledge valuable discussion of this work with the other contributors to this volume.